Tips for lionfish hunting. Hunting lionfish for the last 8 years and in 10 different countries around the Caribbean I’ve speared thousands of them in many different types of environment and structure. In some locations they will be so thick you feel like you’re just taking out the trash, while in other places it feels like someone has been swimming in front of you removing all the lionfish. Here are some of my best tips for successful lionfish hunting. Please share your best tips in the comments below. Lionfish are crepuscular, meaning that they prefer to hunt and feed at twilight. To find the greatest number of lionfish it is always best to try and time your lionfish hunt as close to sunrise and sunset as possible. I know, it’s not always easy to do because charter boats don’t leave that early nor do they like to return after dark, plus we usually like to dive during the middle of the day for maximum sunlight. However during the middle of the day lionfish are often found under ledges where they have a roof over their head and can maintain a low profile until dusk sets in (Tip: Carry a flashlight for shining up into crevices and under ledges). I got a great first-hand look at the difference an hour can make on a lionfish invitational hunt in the Flower Gardens Bank Marine Sanctuary last year where we would make two dives on a marked off section of reef to remove and record the removals of lionfish. If we saw 5 lionfish on the first afternoon dive in a section of reef, and removed them, we consistently came back on the next dive closer to sunset and would see at least twice as many lionfish on the exact same patch of reef. These were lionfish that were hiding during the day and came out as it started getting darker. Same thing for the morning hunts, the first dive of the morning was always more successful than the second dive in the same spot. It’s a peculiar feature of all invasive species that they have a proclivity towards artificial structure in their invaded range. Where there are rubble piles, sunken debris, or shipwrecks there is often a good supply of lionfish and when seeking out new places we often look for the artificial reefs. This list of thousands of artificial reefs in Florida is a great place to start out if looking for lionfish in the Sunshine State. Because the lionfish is a relatively small fish, with the largest on record about 18 inches long, it’s important to spear the lionfish in the head to avoid damaging any of the meat in the fillet. Be aware though that the bones in the head of the larger lionfish are very strong and it can be difficult to pull the fish back off of the spear if there are large or many barbs from the spear tip stuck in the lionfish head. Another IMPORTANT TIP is to always spear the lionfish at an angle from the tail towards the head when possible. 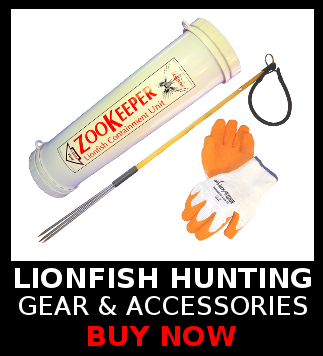 The reason for this is so that when inserting the lionfish into a container such as a Zookeeper you can insert the lionfish into the container head first. If you try to insert the lionfish tail first it will splay out its spines and be difficult to insert. For the same reason that fish tend to swallow other fish head first, the spines lay down towards the tail and it is much easier to shove the lionfish in head first to the container. Similarly, a broadside shot on a large lionfish can make it very difficult to insert into the container because you are trying to push it in sideways. 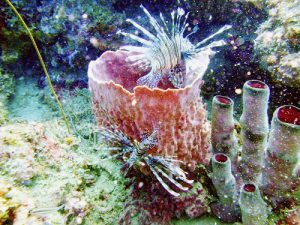 Often in deeper waters and on walls & ledges the barrel sponges can be some of the preferred habitat for lionfish. They like to cluster around the base of the sponges, and sometimes right on top of them. Possibly this is because their preferred food sources also like the same habitat. On shallow reef we often find them under ledges and in holes during the day where they like to hide and keep a ‘roof’ over their heads. A flashlight can be very useful for peering into the larger caves and holes to find the lionfish, and remember to look up because they will often be hanging at the top almost like a bat! Since lionfish don’t have any natural predators they tend to be fearless around divers (unless they have been shot at before, they learn very quickly!) so we can use short pole spears for hunting them. 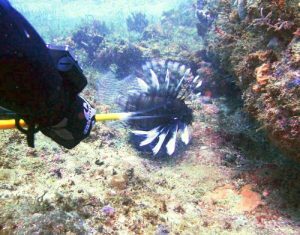 There are many pole spear choices available for hunting lionfish but most people use one in the 3 to 4 foot length with a 3 prong style tip. Some basic rules: Keep your tips sharp, and barbs help but not too many or it’s hard to get the fish back off. Some people like to carry a spare band under water with them, I usually just check my bands frequently for signs of dry rot. Keeping your bands in a zip-loc in the refrigerator helps to keep them fresh for longer. There are many choices for containers to carry your lionfish, this article will tell you everything about the Zookeeper lionfish containment unit. Many people carry a second spear or a stick of some sort for repositioning the lionfish into the container if the shot angle was poor, also for a second shot if the first is barely in the lionfish. I like a second spear also for removing the lionfish from the spear if the lionfish is stuck on the tip after putting it in the container. When out on a lionfish hunt we often like to look right at the base of the reef where the sand meets the structure. It may be that the lionfish prefer these areas because one of their favorite food sources are shrimp and the shrimp like to hang out in the same sandy areas. This is also a great first place to look when checking out a spot because the lionfish stands out clearly against the white sand background but can be much harder to spot tucked up inside a hole. Lionfish inhabit the entire water column and have been found anywhere from a few feet of water down to over 1000 feet in depth. In most areas though people have been diving and spearing lionfish with some regularity so many of the shallow areas have been picked over more frequently. Below recreational diving depths we know that there are a LOT of lionfish hanging out, and often reefs are being replenished with larger lionfish that move in from the depths. Since man is the main predator of lionfish these days, they could be learning that they are safer down deeper. With depth comes more risk, so always dive within your comfort zone. Another useful tip to keep in mind is that many people have reported certain ‘hot spots’ for lionfish. Often this will be a distinctive coral head & cave or piece of structure where lionfish seem to repopulate with surprising regularity. There’s something about these ‘hot spots’ that is drawing the lionfish in, so once you find one of these spots you can go back every few weeks and often find that lionfish have moved back in to the neighborhood. 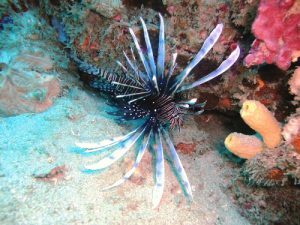 Many dive charters now allow you to lionfish hunt on their boats, in fact we have an extensive list of lionfish hunting friendly dive shops that are available for your next vacation. This is more of a matter of good etiquette. By having your own small cooler of ice you can place your lionfish into the container and other non-hunting passengers don’t have to work around the venomous spines while reaching in to the cooler for a cold soft drink. Remember, the lionfish venom is only neutralized by heat, so a lionfish on ice can still sting even a couple of hours later! I’m saving the most important tip for last. Because lionfish hunting is so much fun it is easy to be distracted and focus on the lionfish while forgetting some of the important safety aspects of diving. 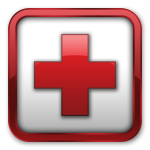 Don’t forget to also constantly monitor your air, depth, and to keep your breathing steady. Always pay attention to your surroundings especially in areas where sharks or eels have been fed lionfish (bad idea!). When you see a lionfish it’s easy to get excited but calm down, take a deep breath and approach slowly. The lionfish is not going anywhere so plan your shot for the right angle and pay attention to what is behind the lionfish. You’re not helping the reef if you damage coral while removing an invasive species. 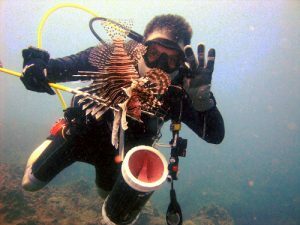 Remember, great divers make great lionfish hunters! Are you interested in learning to lionfish hunt with hands on training from the experts? Check with the non-profit group Ennds.org to find out about their next lionfish hunting dive where they will loan you the gear and teach you the techniques to be a successful hunter. Nicely done, Andy… covered all the best points! Great job Andy! There’s a huge need of divers concerned about the invasion! Thanks Andy, have been spearing lionfish throughout the Caribbean for 3 years and learned a couple of new things from your article that will help increase my success rate. Best tip; venom denatures quite quickly in salt water. Once the fleshy sheath folds back from the spine, the salt water erodes the venom making cleaning with the spines on safe.